Enjoy a fishing trip with us! Here at Denmark Fishing & Outdoor Lodge we are always busy with sea trout fishing along our coast. But every year, we also plan a couple of pleasant fishing trips together with our guest. These trips are organized in collaboration with trustable operators. If you are already a Denmark Fishing Lodge guest, evaluate to enjoy a pleasant fishing trip with our staff! 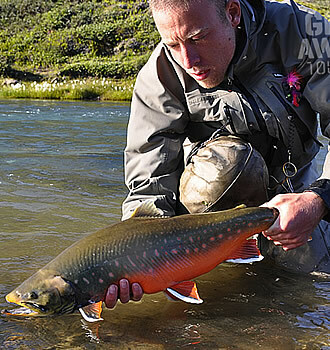 27/07/17 > 05/08/17- Greenland arctic char fishing! The trip of a lifetime. You will leave the amazing landscapes of Greenland. Camp life on the river, deep immersion in the nature. Unbelievable surface fishing for arctic chars in size average between 50cm and 70cm, with exemplars up to 80+ cm! Thousands of strong searun chars in the water, a lot of action, and great company for this amazing trip! Trip in collaboration with getwaytours.dk, specialized fishing tour operator for this destination. Omar Gade will be the tour leader for this trip, he has leaded groups to Greenland since 2010. Here at our Lodge, we know well that the italian part of the Alps, especially Trentino region, is an amazing place for fly fish after grayling, brown trout and the wonderful marble trout. This area has really nothing to envy to Austria and Slovenia, contrarely: it is less known, less fished and not crowded. In addiction, the food is great: we are in Italy! 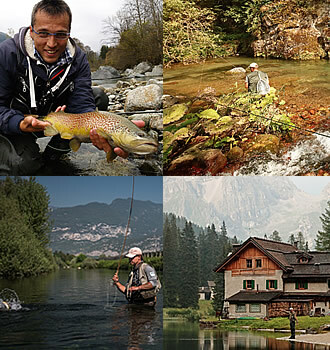 We organize a 3/4 full fishing days trip to Trentino. A “new” destination, easy, close and very affordable. What are you waiting for? Contact us as soon as possible! Price range all included: 500 > 1000 €. Trip in collaboration with the turist board of Trentino and Likeariver fly shop in Italy.